The Southern (known as Gore Farm until 1911) was set in ground of 160 acres and was built by the MAB in 1888-9. The Upper Hospital consisted of 20 two-storey ward buildings and 5 small isolation wards and was opened in 1890, to replace the smallpox camps. The building and equipment for the alterations made between 1890 and 1903 cost £199,569. The remainder of the Lower Southern was opened in 1902. This cost £179,288. There was an outbreak of smallpox and the MAB did not have enough beds as they were in the middle of a seasonal rise in Scarlet fever and Diphtheria cases. The Upper Hospital was full of Scarlet Fever cases. Therefore, the MAB employed Messrs J Hawkin & Son to erect 12 dormitories and to adapt 2 recreation halls to receive patients (each with 40 beds). Because of the risk of infection the workmen had to be boarded in the grounds and were not allowed to visit Dartford. Four police constables were also in residence to preserve law and order. By June, 1903, the MAB had opened Joyce Green, (although it did not admit patients till December) together with the smallpox hospitals at Long Reach and the Orchard it was decided that Gore Farm Hospital would no longer be needed for smallpox, so both the Upper and the Lower provided treatment for fever and general convalescence. The Upper was handed over to the United States Military Authorities in June 1918 and was known as U.S. Base Hospital No. 37, and treated American wounded soldiers. Their Majesties King George V and Queen Mary visited the base in October 1918. This was the first time the Royal party had ever visited and inspected an American Base Hospital. The Times newspaper report said’ The Royal visitors made a tour of the wards, and strolled through the grounds, chatting with some of the patients. They visited a concert hall decorated by one of the patients (Di Lorenzo), and spent some time in the officer’s wards. In the “shock” wards, their Majesties were interested to notice the variety of maps, pictures and ornaments, such as not usually seen in hospitals. The officer in charge informed them that the cases treated here seldom required medical aid, and every effort was made to claim their attention and take them out of themselves. Selections from the poets were read to them, and they were encouraged to discuss current events. So far, the results had been satisfactory. Before leaving the King and Queen expressed the pleasure their visit had given them, and they were heartily cheered by the patients as they drove away’. The Base Hospital returned home in 1919 but American Base Hospital Veterans returned and placed a plaque at the Southern on May 20th 1955, to commemorate their stay. The Veterans consisted of Dr Edward F Fox (accompanied by his wife) who represented Col. Henry Monroe Moses, Chief Medical Officer in 1918, and the medical staff of the ‘old 37′. John Pontin who represented the enlisted men and Mrs Amiee Stewart Bradstreet who represented the nurses’ corps. Mr Pontin wrote in the Kinco Chow, the Newsletter for the Enlisted Men of the Base Hospital, “Upon our arrival at Dartford we found so much was new. The fields were now housing developments. But as our driver set us down at the gates of the Southern hospital, the scene seemed as unchanged as ever. A letter was sent to the Veterans when the Southern closed 4 years later inviting them to come to Joyce Green. A few postcards were received from Mr McAfee (who had written to the Hospital Management Committee in 1954 and made all the arrangements for the plaque but had been unable to attend the presentation because of an accident) to Mr Parry and Mr Durrant but nothing has been heard from them since 1961. The plaque in now in storage at the Dartford Museum. After the War, the Southern was again used for fevers. When it was not needed for fevers, children from London requiring convalescence and fresh country air were received in large numbers (often as many as 1,500). Playing fields were laid out and special indoor recreation facilities were provided. n 1930, control of the hospitals was passed to the London County Council but their roles remained unchanged. September 1938 saw the Munich Crisis. The Royal Naval Hospital at Chatham was evacuated to the Southern and some 300 naval personnel were transferred there. Upon the outbreak of the Second World War the hospital was taken over by the Emergency Medical Service and classed as a Group 1 Emergency Medical Service Hospital. Each hospital was classified according to the facilities available and a considerable amount of upgrading was undertaken in order to provide operating theatres, x-ray services and improvements in wards, so as to deal more effectively with large numbers of casualties. The Southern became one of the largest general hospitals in the country with 1,580 beds. More casualties from Dunkirk were admitted to the Southern than to any other hospital. The hospital retained the Medical Superintendent Dr R G Henderson. He was made Commanding Officer of a naval unit at the hospital and appointed Surgeon Captain in the Royal Naval Volunteer Reserve, one of only two in the history of the reserve. In 1947 he was awarded a CBE for services in medicine. The rehabilitation of soldiers was under the care of the Naval Schoolmaster, Mr Lacey. The physical and mental rehabilitation of the soldiers was given equal importance. The hospital library had 10,000 catalogued books and 3 full-time librarians. The library was open every day for ambulant patients to visit and librarians visited the wards every day. Most of the books were presented to the hospital by the British Red Cross and the Order of St John of Jerusalem (some of these are still in the stock in the library at Joyce Green!). Education and vocational instruction were also important features of hospital rehabilitation. The hospital had 3 large classrooms, a picture gallery, lecture room and cinema. Correspondence courses and postal study courses were also available in a variety of subjects. The picture gallery contained 70 reproduction of famous masters and regular lectures given on art appreciation. In this room groups also listened to gramophone recitals. Lecturers in art and music regularly attended these classes and lecturers were also used for other educational subjects. Later the Southern took causalities from the many ‘blitzes’ on London. 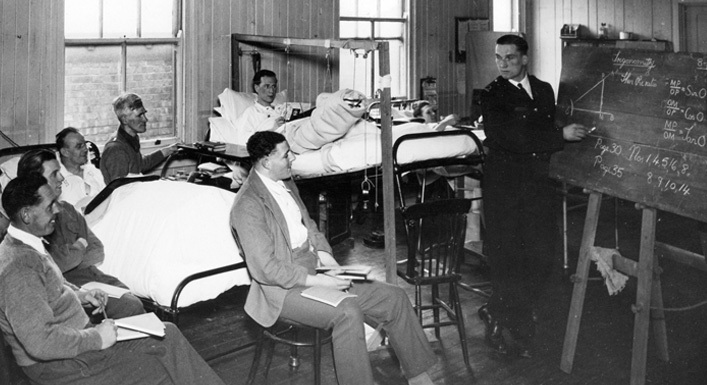 During the war years, the Southern treated 51,975 patients. These included 21,913 Naval Personnel, 9517 Army personnel, and 20,545 civilians. After the war, the Southern did not return to fevers and convalescence but remained a general hospital. With the inception of the NHS in 1948 the management of the hospital transferred to the Hospital Management Committee, and for the first time became a part of the Kent hospital services. It served the people of Dartford as a general hospital until its closure on 31st July 1959, when the staff and patients were transferred to Joyce Green. The buildings were not suitable for modernisation, as were the Joyce Green buildings. The Medical Superintendent (MS) of the Southern, Mr Henderson, was also leaving. He became MS in April 1940. He designed and made the first iron lung used in this country and he had designed the group badge. He said at his leaving presentation that he felt the move to Joyce Green was wrong, and although the hospital was very old it had very good staff accommodation and was at the gateway to London. He felt that the Hospital Management Committee had failed. They had failed to keep the hospital life full and active. Dr Henderson was to be offered a post at Joyce Green as honorary consultant but he said he was temporarily going north and did not take the position. He later married and became a farmer and propagator of roses. He died in December 1999, aged 97. The Chairman of the Hospital Management Committee, Mr L O Kekwick said that a new swimming pool at Joyce Green was being looked into to commemorate the amalgamation of the hospitals. The pool was built and was dedicated to the amalgamation of both hospitals when it opened in 1961. The Southern was demolished in 1967 to make way for the A2. After the war the Lower Southern was partly demolished and, in 1955, the remainder was reopened to receive the Polish Ex-Services rehabilitation unit and was renamed the Mabledon Hospital as the unit had moved from Mabledon Park, Tunbridge Wells. The unit, soon afterwards, was classified as a neurosis unit and in 1959 as a psychiatric unit. It had a full complement of Polish medical and nursing staff. The patients worked hard to transform the depressing huts into comfortable accommodation surrounded by terraces of well-kept gardens and flowers. The patients also built themselves a Centre from scrap from the Southern site. The Centre had television, library, reading rooms and a canteen. In the 1980’s, the patients were moved to Stone House and the hospital closed.